The foundation of your home gym, the TRX Training Mat enables you to comfortably fit your workout in anytime, anywhere. Essential package of Performance Therapy products to maintain a healthy body and active lifestyle. 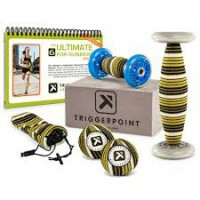 Includes Instructional guide for runners that covers six releases using the included products.